Heat oven to 350ºF (325ºF for dark nonstick pans). Place paper baking cup in each of 24 muffin cups. Make cake batter as directed on box--except gently stir chocolate chips into batter. Divide batter evenly among muffin cups (about 2/3 full). Bake 20 to 25 minutes or until toothpick inserted in centre comes out clean. Cool 10 minutes; remove from pan to wire rack. Cool completely, about 30 minutes. Decorate as desired below. Store cupcakes loosely covered at room temperature. 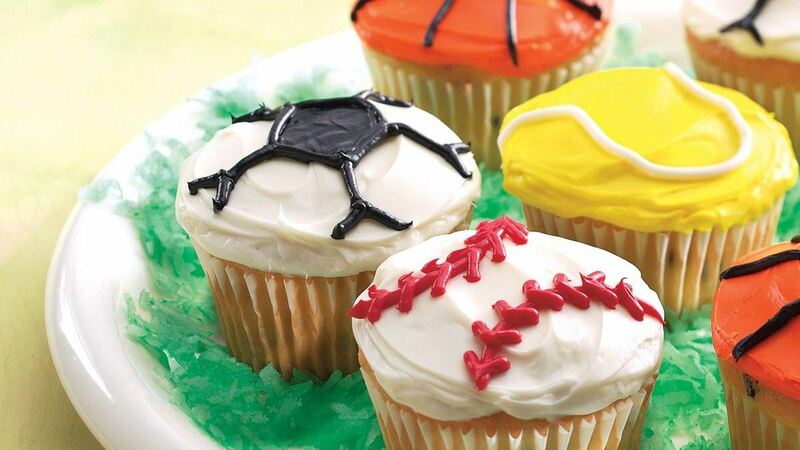 Baseballs: Frost cupcakes with vanilla frosting. With black, red or blue icing, pipe 2 arches on opposite sides of cupcakes, curving lines slightly toward centre. Pipe small lines from each arch to resemble stitches on a baseball. Basketballs: Color frosting with yellow and red food colors to make orange; frost cupcakes. With black icing, pipe line across centre of cupcake. On either side, pipe an arch that curves slightly toward centre line. Soccer Balls: Frost cupcakes with vanilla frosting. With black icing, pipe a pentagon shape in the centre of cupcake, piping a few rows of icing into centre of pentagon. Pipe lines from pentagon to edge of cupcake to resemble seams. With toothpick or spatula, spread black icing in centre of pentagon to fill in the entire shape. Tennis Balls: Color frosting with yellow and green food colors to make tennis-ball yellow; frost cupcakes. With white icing, pipe curved design to resemble tennis balls. Special Touch : Arrange cupcakes on green grass. To make grass, shake 1 cup coconut and 3 drops green food color in tightly covered jar until evenly tinted.